Gone are the days when students in the classroom were learning through textbooks. There are no more blackboards, where teachers used to write, explain and teach students. Now, the classrooms have been digitalized with the smart learning process. Today, education startups, institutes and schools have a strong ICT infrastructure for students to include educational apps as a part of the learning process. Education app development is the main concept, which is boosting the education technology market. According to Technavio analysts report, the education apps market in the US is expected to grow at a CAGR of over 28% during the forecast period. When it comes to talking about the world’s fastest-growing education app, Kahoot, a Norway-based educational quiz startup, has announced that its platform reached 70 million unique monthly active users (MAUs) at the end of 2017, growing at a rate of 75% year over year. Below is the graphical view of Kahoot app usage since its launch. According to the latest news from TechCrunch, Kahoot, one of the leading educational learning apps and gaming startups, has raised another $15M, now at a $300M valuation. For some content, the education startup has also declared that it has raised $17 million in March at a $100 million valuation. More than 1.6 billion players have played on the Kahoot! 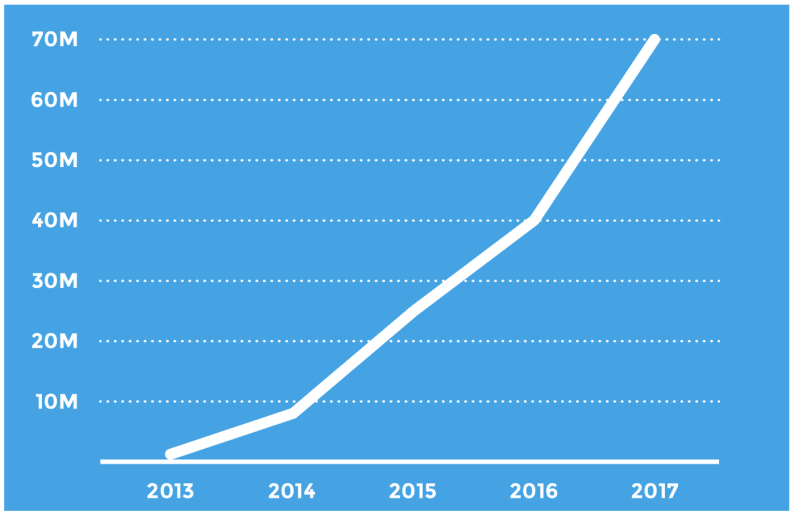 platform since its launch in 2013. 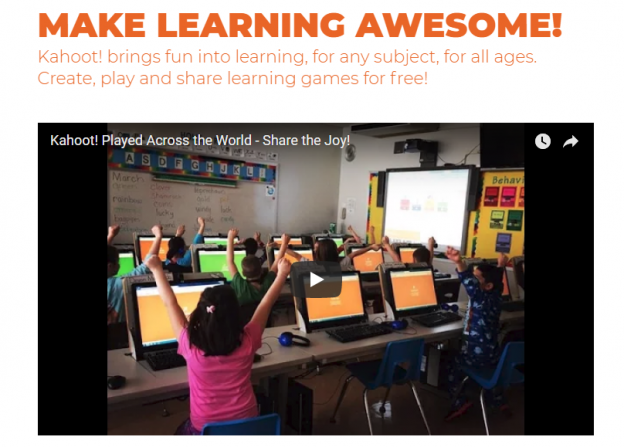 It makes Kahoot one of the most widely used technologies in K-12 classrooms in the world. As per the latest news from TechCrunch, Kahoot has announced a new initiative, helping to position the popular startup that already has 60 million games and has seen over 1 billion players engage on its platform. It is launching Kahoot! 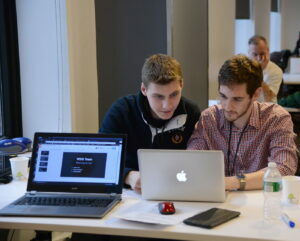 Ignite, a new accelerator for like-minded startups that are pushing the boundaries of education through gaming and other means. Kahoot is one such education quiz app that has a million corporate users, 25% out of it work at Fortune 500 companies and usage of it grew 100% year-over-year in 2017. 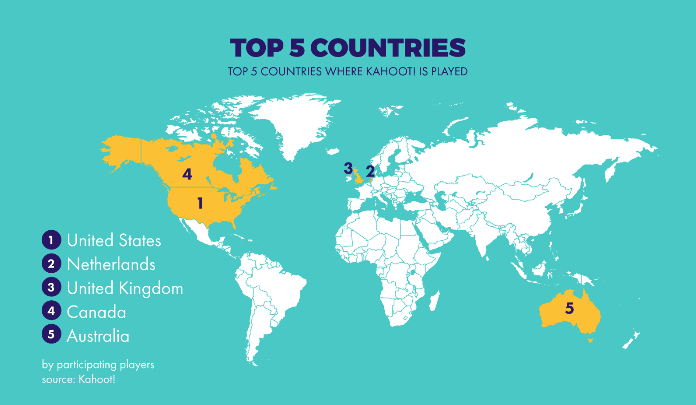 Every second more than 3.3 Kahoots are hosted and approximately 200 Kahoots every minute worldwide with 240 questions answered every second and 14,400 answers every minute. In 2017, 47% of U.S. K-12 teachers used Kahoot app. Since its launch, 1.6 billion cumulative players have been participating on the Kahoot platform and out of which 1 billion are in the United States. Furthermore, according to the latest report from TechCrunch, “The education quiz app, Kahoot has raised $17 million at a $100 million valuation”. However, the basic Kahoot, free education app, is for students and teachers. The education startup company has already picked up business from Facebook and Uber (ride-sharing giant). According to the latest report from SensorTower.com, Kahoot! has secured the sixth position in the list of the most downloaded education apps in the U.S. for the year 2018. How Kahoot App Makes It Big in the U.S. Market? Kahoot, one of the top mobile education apps, has taken the U.S. market by storm since its launch. 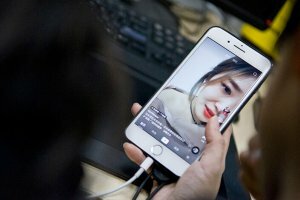 The Norway-based education startup has claimed that out of 70 million monthly users, 50 percent – or 42 million – users are in the U.S. It also added that more than half of all its U.S. users are K-12 students, who use Kahoot every single month. The app has made it big in the U.S. market by launching a number of new products last year, including Kahoot Studio that is a library of curated Kahoot game collections aimed at K-12 teachers and students. Moreover, the exponential growth of the Kahoot particularly in the US has helped the education startup to close out a Series A round of $20 million last year, making its total raised to $26.5 million. The number of investors, including Disney and Microsoft along with Nordic VC biggies Northzone and Creandum, took part in the funding round. 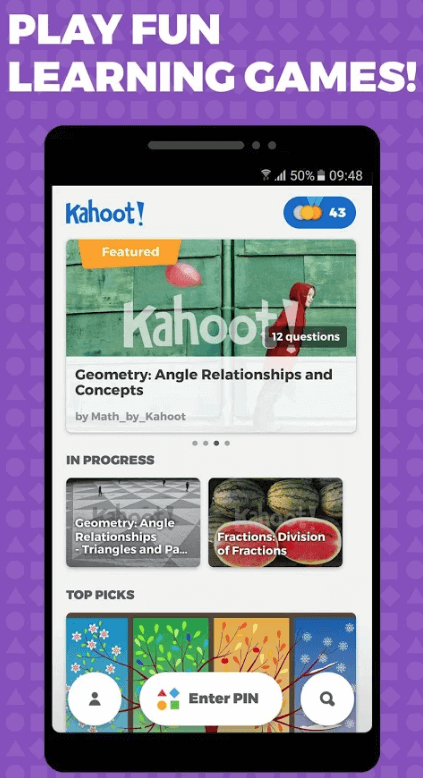 Considering the growth of Kahoot app, if you have decided to make Kahoot like app or education mobile app, make sure to go through from these four important lessons that you can learn from the app and know why the app has gained huge popularity among its users. One of the main lessons that you can learn from the Kahoot application is that it allows students to learn by playing different game activities. Students of different grades can find enormous games of different subjects and can learn while playing and having fun with their friends. 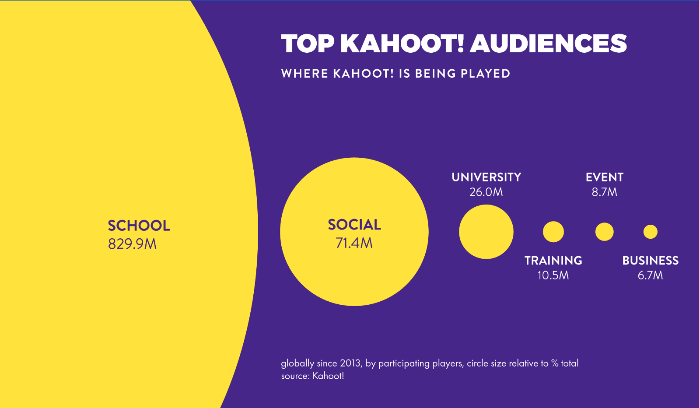 So far, Kahoot has 51+ million games on its platform that are by its users and by Kahoot itself. Whether students are learning in the classroom or on their smartphone, they will be given 30 seconds to answer and correct answers will give points while additional points are scored for instant clicking. The education startup has claimed the Kahoot will bring fun into learning for any subject for all age group of students. Thus, create, play and share learning games for free. Another important lesson that you can learn is that the application has something for every single student, teacher, and corporate trainers. It’s like a quiz show and there is something for everyone in this app. Every student is engaged, and no one is left out in this educational quiz app format. Check out the below-given video in which you can see how students of all age groups worldwide are enjoying learning and having fun with each other using Kahoot school app. Completely different from a traditional classroom, where some will always be engaged, and some are getting bored, but this application helps all the students to participate equally and compete on Kahoot. Apart from students, teachers also have strong engagement with this application as they are making it a part of their teaching platform. Using this platform in the classroom, teachers make learning fun and helping all the students to take part in the quiz and try to score more. Moreover, there are various biggest companies like Facebook, Uber, PwC and other well-known brands that are using this platform for training, sales and HR, and retail training. It is a platform on the corporate side as well that allows companies to have the tools to create their own Kahoots. The third most important lesson that you can learn from this application is that it has become the most relevant global learning brand for today’s learners, but how? The platform is designed for today’s learners considering their requirements. Whether it’s students, teachers or corporate employees, the app can be easily used by all of them and learn in a new and interesting way. Counted as one of the top 10 tools for education in the K-12 classroom in the U.S., according to the Center for Learning and Performance Technologies. For everyone, the app offers a fun and social gaming experience to play learning and trivia quiz on the go and challenge friends and family members. So, students of all age groups, teachers and corporate companies can try this widely used platform to get a wonderful learning experience. The fourth lesson that you can learn from Kahoot is that it has solved the real-life problem of students and teachers, allowing them to connect and make learning fun and enjoyable. Now, both students and teachers can enjoy in the classrooms by learning through a quiz competition of different subjects like Math, Science, Multiplication and other subjects. Teachers can create a quiz on different subjects with interesting questions and answers and make it a fun activity. The application is understanding the problem of students to memorize and learn every subject. A lot of students find it difficult to learn about formulas and different lessons, so Kahoot has made it a lot easier for them. Now, they can go through with the quiz on any subject that created by their teachers or other Kahoot users. Apart from this, teachers can extend learning beyond the classroom, whereby teachers can challenge students to play Kahoot at home, on the go or anywhere they get time. Teachers can conduct different quizzes for students, who are spending an increasing amount of time on their mobile devices, giving them an opportunity to review educational material online. Note: Developing a successful education app like Kahoot or create a Kahoot like solution is not as easy as it sounds. The company has worked hard and solved real-life problems of its targeted audience. They have constantly improved their application with useful features and updates to suffice its end-users needs. So, if you also want to create education app like Kahoot, make sure to authenticate your idea with any leading Android app development company. Know whether your idea is solving a real-life problem of your targeted audience or not. So, these are the four important lessons that you can learn from the Kahoot education quiz app and by considering these lessons in mind, you can make Kahoot like app that gives a solution to students and teachers and make learning interesting. What do you think about create Kahoot App and its features? If you also think that your education app idea can make a difference in students’ life, tell us your idea. 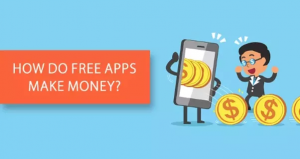 We will come up with a plan to make it a real money-making app. The consultation is totally free of course! This page was last edited on March 22nd, 2019, at 8:55.